moonSTEEM V2 is finally LIVE ! The wait is over ! Now you can try to moon your STEEM again everyday. We have a series of exciting upgrades and changes on V2. For new players : What is moonSTEEM ? ➡ Anyone can play, even without deposit, just use the unique feature of the Steem blockchain (voting power), upvote @moonsteem posts and/or comments for 'FREE' Steemies to play and chance of mooning your steem ! Faucet System, Upvoting @moonsteem posts/comments, you get Steemies recharge (beautiful feature of the Steem blockchain, your voting power recharge daily so you can play without ever making any deposit) to your account. Usually takes about 1min to be reflected, you might need to refresh your game page if you’re already logged in. If you’re a first time player, please make sure you login to https://www.moonSTEEM.com first with steemconnect before you do the upvote. Click ‘Faucet’ on your account page to check the Steemies credited to your account via upvoting. Automatic withdrawals are limited to 10 STEEM per account per 24 hours. Above that limit, withdrawals will need admin confirmation (usually less than a few hours, depends on load). ....but....it turns out you sent it to me. Thanks! I'll get in on this one now! yeah data was clear from v1 as we revamp the dividend distribution system. All investment was trf back and reimburse with the loss dilution fee if any. I invested 100 STEEM, best investment ever ;-) ! Can I delegate SP to receive dividends? Why there are few players? How will you increase them? certain timezone the players active are lesser. usually US timezone u will see more players. Is there a new "random number" calculator process for v2? I know that the 0 Bust was removed, but were there any other changes? the house edge was change to 2% fix on multiplier instead of scaling. H! How can I delegate my SP? How will you use delegation and above all how many tokens are obtained by delegation? The game is really very nice, simple and innovative! Thanks! Where do I see how much I earned daily with the investment? I've already invested 50 Steem! 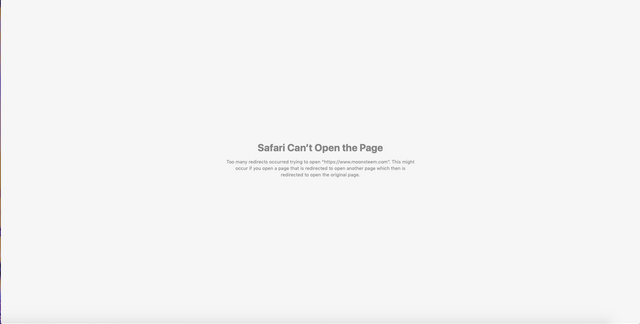 Site won't load for me, google says too many redirects. Yup, that was the problem, thx. what's the purpose of the token ? Ah so it's based on how many tokens you have or on the investment ? Can't wait to win some money from everybody else's losses! Time to moon some STEEM! I've deposited 50 STEEM: 45 STEEM for the bankroll and 5 STEEM for the playing balance. This should be a good investment. I'm interested to see the new dividend system works out. I've not gotten an opportunity to play just yet, though it sounds pretty fun. It definitely looks pretty awesome. I think whoever said we're going to take over the world is absolutely correct. We just have to wait till it happens. anyone else getting this when clicking the link? Boom 1000x ! to the moon! So excited to have the site running again, with the new features like tipping people! Good work guys, now to watch it grow again and become even bigger. Congratulations on the launch of moonsteem V2. It looked like you guys were closed for business when you'll returned my investment. I will surely reinvest in moonsteem again. thx see u in game! An error occurred during a connection to www.moonsteem.com. Works OK in private mode. Probably gonna have to remove cookies and temp files. I got the same message.. Clearing cookies solved the problem! You are Back and I am the FIRST One to Comment on this Post and it will sure be Fun to Get some STEMMIES and Play Again.....To The Moon Alice !